Spicy meat-a-balls aren't just for Spaghetti anymore! These taste treats have all the flavor of buffalo wings, all rolled up in cute little balls just perfect for lunch, dinner, or party appetizers. This quick & easy recipe is adapted from Rachel Ray. 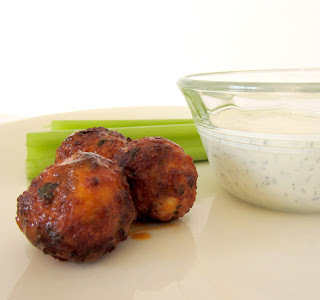 Serve them up with celery sticks and your favorite bleu cheese dressing (or, if you're like me and your throat clenches at the very thought, your favorite ranch dressing or dip). 1. Heat the oil in a small skillet set over medium-high heat. Once hot, add the onions, garlic, and salt to the pan. Cook, stirring often, until the onions begin to soften. Transfer the onion mixture to a plate to cool completely. 2. In a small bowl, whisk together the egg and milk. 3. In a large bowl, stir together the bread crumbs, parsley, and black pepper. Put the ground chicken in the bowl along with the onion mixture and the egg mixture. Use your hands to blend the ingredients. Be careful not to overmix. 4. Use a 1 1/2" scoop (or you can use a tablespoon) to scoop portions of the mixture onto a parchment-linen 9"X13" baking dish (they will be very close together). Cover and chill for 30-60 minutes (to allow the balls to firm up a bit). 5. Preheat the oven to 350° (you can also deep fry these meatballs in 350° oil until cooked through, then transfer them to paper towels to drain - this will give the golden crust as seen in the photo, though the baked are just as tasty). 6. If desired, gently roll the chilled portions into balls (as is, the bottoms are probably flat). 7. Bake until cooked through (about 20 minutes). 8. Meanwhile: stir the butter and hot sauce together in a large saucepan set over medium-low heat. 9. Toss the cooked meatballs in the hot sauce mixture to coat. Serve!